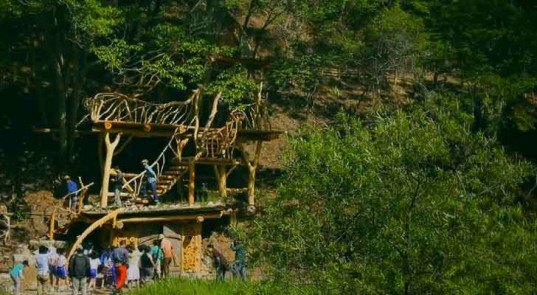 “Tree House Guru” Takashi Kobayashi has created something spectacular for the child survivors of the Japanese Tsunami: a magnificent treehouse that melds with its environment to create a safe, beautiful haven. Kobayashi’s intent was to create a space in which the children could feel secure, while allowing them to conquer their fear of nature and regain an appreciation for the natural world. The ground floor is built into the mountain like a hobbit-hole, complete with stone fireplace, and the upper stories wind through cherry and sycamore trees. "Tree House Guru" Takashi Kobayashi has created something spectacular for the child survivors of the Japanese Tsunami: a magnificent treehouse that melds with its environment to create a safe, beautiful haven. Kobayashi's intent was to create a space in which the children could feel secure, while allowing them to conquer their fear of nature and regain an appreciation for the natural world. The ground floor is built into the mountain like a hobbit-hole, complete with stone fireplace, and the upper stories wind through cherry and sycamore trees.